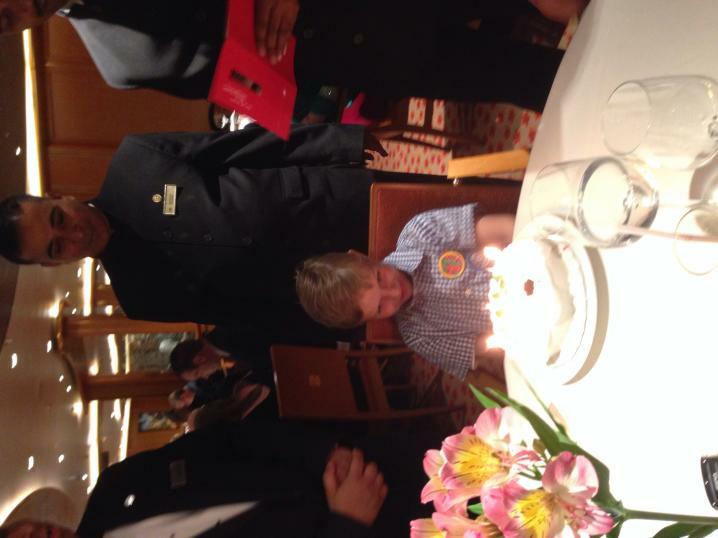 Today was my 7th birthday and I had it on a cruise ship in the middle of the Mediterranean - how cool is that??? I got a mini iPad and an underwater camera and some swim goggles and some chocolates which spelt Edward and a pirate pencil and a finger puppet and a dragon puppet. I thought they were cool! There were two birthday banners and lots of pirate balloons all around our cabin. It was chocolate day in Kids Club. They wrote Happy Birthday Edward on the door to my room. In the evening Mummy, Daddy, Granny, Grandad, Elizabeth and I went to the special fancy restaurant. The restaurant staff and Officers sang happy birthday to me. I had two birthday cakes - one from Kids Club and one from Mummy and Daddy. It was a great day.